The Motion is for riders looking for unrivaled versatility in one "do-it-all" design. 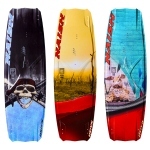 This board offers everything from freeride and freestyle performance to twin tip waveriding functionality. The Motions surface area, full rocker, beveled tunnel edges and responsive flex provide balanced power, superior edging, soft landings and a smooth ride in chop. Its solid pop and directional stability help riders of all abilities take their riding to the next level. Medium Flex F40 = Ideal for slow-to-medium speed riding. 3-Stage Rocker R7/3/20 = Chop-eating and forgiving rocker + back foot directional stability. 3D Step Rails = Thin edges for solid grip. 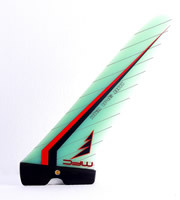 4 Angle Fin Platform = Superior grip.